8:10am - Ms. Burton picks up her students from the cafeteria, where they have been dropped off by their parents. Once in the first classroom of the day, students take out their Communication Journals (where they list their homework and assignments), their homework from the previous evening, and their permission slips for the upcoming Winter Gala event. 8:15am - The first class of the day is Math and Science with Ms. Gousia, a Subject Expert Teacher in those fields. Class begins with a Math Meeting: one of the students leads the class in reviewing today's date, the number of the day, today's pattern, and the problem of the day. This class, Savannah is leading the Meeting. "What day is today?" she asks the class. After they respond correctly, she continues, "What day will it be one week from today?" "How did you know that?" asks Ms. Gousia. "If you add 7 to today, you get it," says Andrew. Next, students share their number sentences they created for the number of the day, which is 47. Each student has created a different equation to equal 47, using addition, subtraction, multiplication, or division. The class, led by Savannah, reviews the pattern of the day, and writes out the coin and dollar amounts to total $2.13 in two different ways to practice their fractions and money skills. To end the Math Meeting, they all count backwards from 1000 to zero by 25s. "Caia, I am giving you a STINGER," says Ms. Gousia after they reach zero, "because you counted all the way back to zero, and you didn't give up." The STINGER awards are given to students who demonstrate the school values, and earning one in class puts the student in the monthly drawing to win a prize bag at the end of the month. Ms. Gousia writes out an award to Caia, who places it proudly on her desk. Ms. Gousia passes out pattern blocks to all the students. 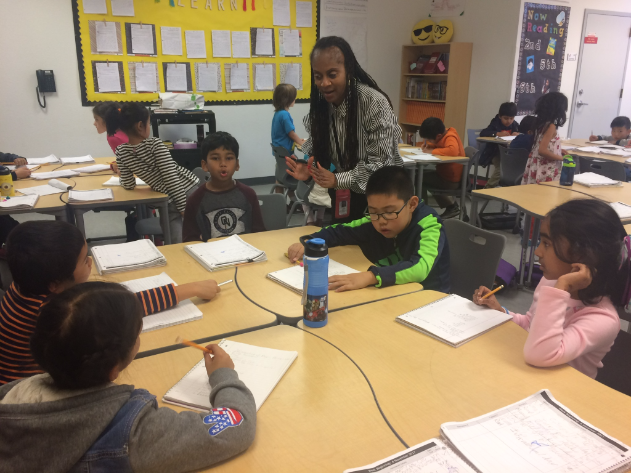 Today, they are learning about equal groups, a skill that will help them with their math courses through the fifth grade. "When I tell you I'm looking for 'equal groups,' what else does that mean?" asks Ms. Gousia. Students practice creating equal groupings of blocks and repeating those patterns. Soon, desks are full of piles of four bricks, three bricks, or five bricks, depending on the number the student chose to repeat. Midway through the lesson, Ms. Gousia re-explains, "You have to ignore that the shapes of the blocks are different. You are not making a pattern with shapes, you are making a pattern of numbers." Ms. Burton and Ms. Gousia walk around the class to check everyone's patterns and add extra explanations and guidance if necessary. Ms. Burton also reminds a few students to please sit properly, with their feet on the ground, not on their chairs. After the equal groups lesson, students move on to a couple worksheets to practice their multiplication and measuring skills. 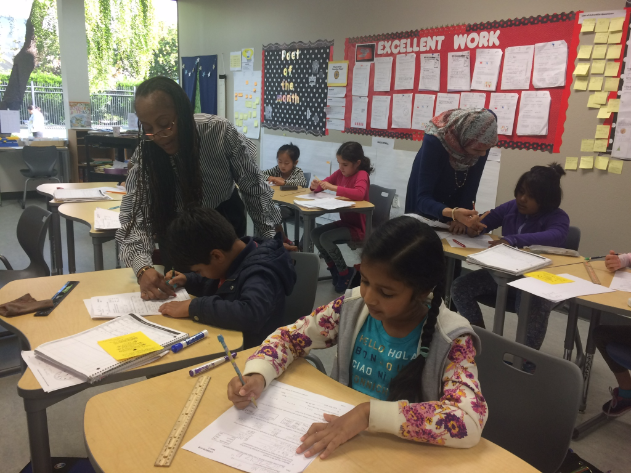 Reinforcement of learned concepts is a crucial piece of the successful Saxon math method taught at BASIS Independent Fremont. 9:40am - Time to pack up and head to recess! Several students got STINGER awards during Math class today, and they take turns going to the Director of Student Affairs' office to claim a small prize and enter their STINGER award in the monthly competition. 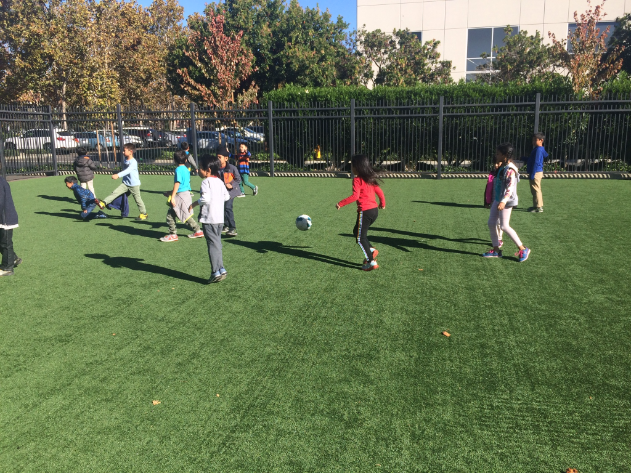 On the playground, the second graders are playing a lively game of 5-ball soccer! 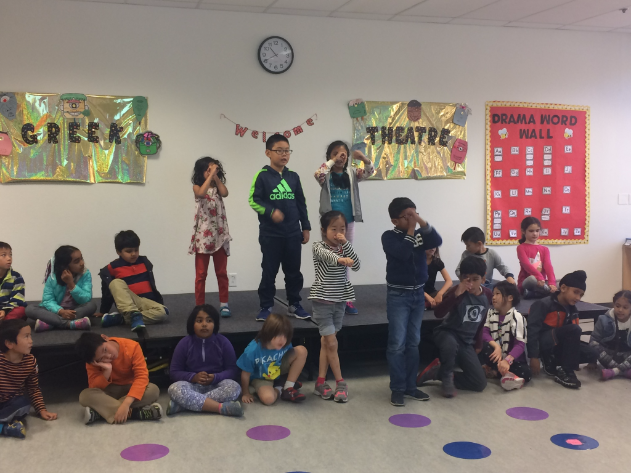 10:05am - Recess is over, and it's time for Drama class with Ms. Burley! Class begins with students turning to a partner and answering the question "What is something that is easier to do together than alone?" and reviewing the rules for the Winter Gala. "It's important to respect our teachers and other students," Chun says, talking about how to behave when others are on stage. "Yes! We want everyone to feel safe with their bodies and safe with their feelings, " Ms. Burley affirms. Meghna and Gurnoor lead their fellow students in some warm-up exercises, including goofy jumping jacks and stretches! A few students then try the tongue twister of the day before moving on to the heart of the lesson: practicing blocking and choreography for the Winter Gala. After a brain break where students get to dance around, Ms. Burley moves on to a discussion about production roles. Today's featured role is the maskmaker and puppet department! 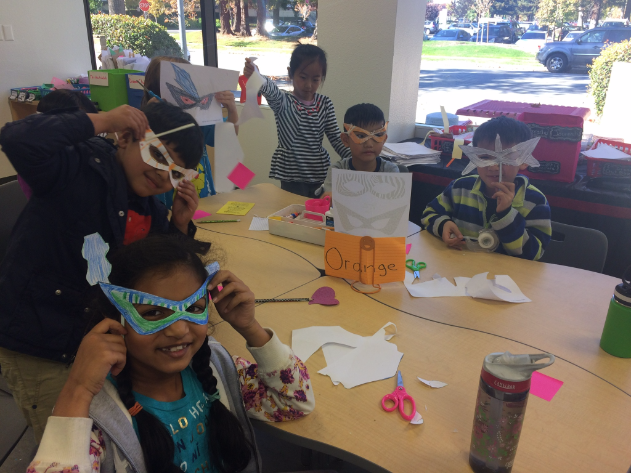 Students finish class by making their own masks themed after the song they will be performing for the Gala. 11:30am - Lunch time! Ms. Burton leads her class to the cafeteria, where they eat lunch from home or from the food service provided at school. 12:05pm - Recess time again! Everyone loves running around outside. 12:20pm - Next up is READ class, where Ms. Burton continues a discussion with her students about the upcoming International Day. The country they will be presenting is Costa Rica, and today Ms. Burton wants them to hypothesize what they will learn about the country. "Start writing down your ideas of what you are going to present. If you are in the entertainment group, today write down what you think they do for fun in Costa Rica," she says. "Don't just put 'sport'," she says, going around to each group to answer questions. "Be specific! Do they play soccer, football, baseball?" When she goes over to the 'jobs' group, she reminds the students that the jobs in Costa Rica won't all be the same as the jobs in Silicon Valley. "This is a third world country. They don't have the things we have in America. Think again. Don't think about where you live, think about Costa Rica," she says. "What do people there grow up to be? What are the common jobs?" 12:45pm - Time for Mandarin class! The Neon class joins with their fellow second graders in the Argon class, and divide into heritage speakers and non-heritage speakers for class. 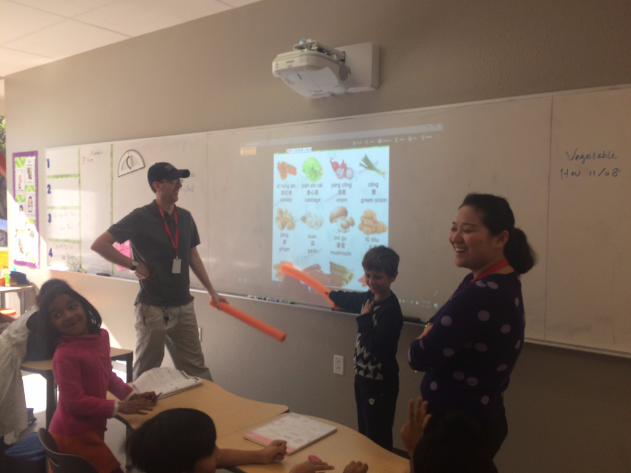 Today in the non-native speaker Mandarin class, Dr. Hong is teaching the students about vegetable vocabulary words. Students watch a video about the vocabulary they will be reviewing today, showing different vegetables and their proper Mandarin pronunciation. Then, Dr. Hong starts a vocabulary game for students to practice their comprehension. Two students go up to the board and point at the foods she says and try to point to the correct word before their opponent. In the final round, Rohan plays against Argon's Learning Expert Teacher, Mr. Brown! The students cheer Rohan on as he lunges for each word before Mr. Brown can get there. 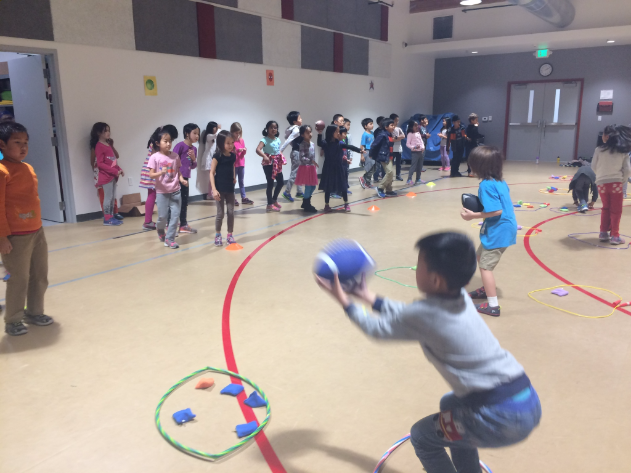 1:45pm - In Phys Ed this month, students are learning about football! Today in class, they practice their throwing skills. 2:30pm - Humanities is the last class of the day. Ms. Villanueva begins by reviewing vocabulary with the students and asking what each word means. One of the words is "wishes" and students are using the word "wish" in their definitions. "But what does 'wish' mean?" asks Ms. Villanueva. "We want to use a word besides that to describe 'wishes'." After vocabulary, the class moves on to a new topic: the southeast states! 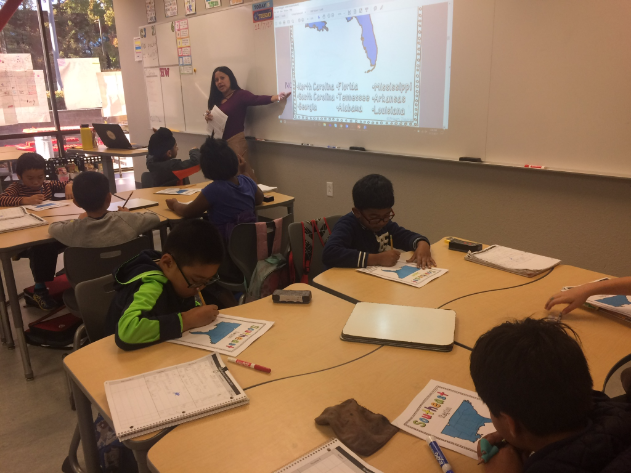 Ms. Villanueva reviews the state abbreviations and points out where each state is located on a map of the United States. As a class, everyone reviews a paragraph about the state of North Carolina, and Ms. Villanueva asks questions to test everyone's reading comprehension. There are also several words in the paragraph that students don't recognize, such as "lavishly" and "meticulously." They use context clues to figure it out. "What might another word for 'lavishly' be, if we look at the whole sentence?" Ms. Villanueva asks. 3:45pm - Class is over! Everyone packs up for dismissal, and Ms. Burton lines up her students and walks them to the dismissal point. It's been another action packed day in the second grade! 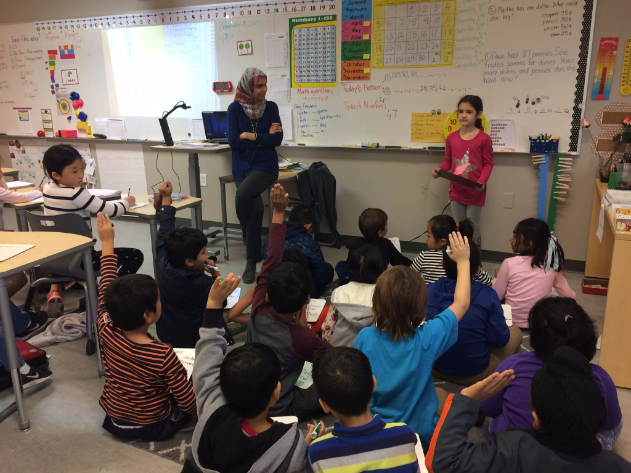 At BASIS Independent Fremont, our second graders thrive in the Learning Expert Teacher/Subject Expert Teacher environment. They are with an early childhood education specialist all day long, who can work with them individually as needed to make sure they are on track with their studies, and have the benefit of being taught by many teachers who are each experts in their field. "Second grade is a wonderful year at BASIS Independent Fremont," says Dr. Ashley Leyba, Head of School at BASIS Independent Fremont. "My daughter is in Ms. Burton's class, and as the Head of School and as a mother, I can think of no better place for her to learn and have fun!" Don't miss our next post! Subscribe to our blog and stay tuned for the next post giving you an inside look at BASIS Independent Fremont. Check out our upcoming events and follow us on Facebook, Instagram, and Twitter for the latest buzz from BASIS Independent Fremont!